When you’ve spent countless months writing and editing your book and preparing it for publication, it can feel as though you have finally made it to the end of the tunnel as you head into publication. But while the book writing part is over (YAY! and CONGRATS! ), there is a new stage that you’ll now find yourself in the months leading up to and after the release date: letting people know about your book or book marketing. The publishing industry has changed a lot over the last decade and it is still changing. Digital- and self-publishing have shaken up an industry that for years was built upon a specific method of finding authors, choosing what to publish, and getting the book distributed and marketed. Now, the onus of marketing often falls to you, the author. Even if your publisher provides marketing, there is still an expectation that you will be an active participant in promoting and selling your book. Most authors didn’t major in marketing and often find themselves overwhelmed and confused by the task. When I did a survey among authors and asked them to tell me about their pain points, the common response was marketing, specifically online. Because of this uncertainty, many authors opt for the obvious: Facebook, Twitter, and LinkedIn, among other social sites. 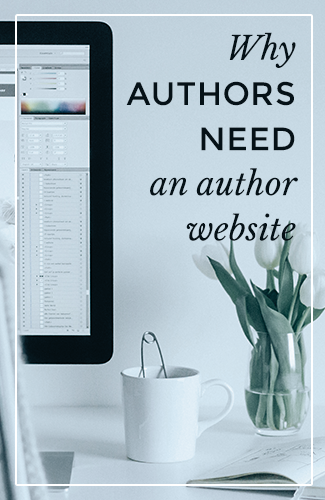 While these are all good and, I dare say, necessary, there are reasons you shouldn’t rely on just those tools for your marketing efforts, and why you truly need an author website. You don’t own Facebook, Instagram, Twitter, or LinkedIn. They can all go away tomorrow. If your entire platform is built on a free tool that you don’t own, if it goes away, if they change their algorithm, change their terms, or begin to charge for views, you will be at a huge disadvantage, and might find yourself having to restart all of your efforts elsewhere completely from scratch. Facebook and LinkedIn only look and function one way. While they have expanded some of their features recently, there are still certain things you cannot do on those platforms, such as selling directly from them, or collecting emails for your newsletter (you plan on having a newsletter, right?) With a self-hosted site, you can add in functionalities that help you connect more with your readers, customize it to show off your personality and style, and provide it all in an organized, helpful manner. When all of your fans and potential readers are scattered all around the internet it’s difficult to connect and create a community. It can also water down your efforts rather than concentrating them. Having a website allows your readers a place they can always access and connect with you. Your website can be the place you point your fans and readers to when they want to see your upcoming events calendar, freebies, chapter downloads, book reviews, and more. Add in some ecommerce functionality and voila, your site can help you sell your book in ways that allow you to also provide a special touch by sending the buyer a personalized thank you note, or a free gift. All marketing efforts should include pre-made Pinnables, Tweets, Instagram-ready images that allow your fans to easily share info about you and your book. This is much easier to provide and point people to when it’s located in a central spot. While your personality can shine through on any online tool, customizations and the profile sections are limited. Providing a central spot to direct readers to allows them an opportunity to learn more. If you choose to include a blog on your site, this allows for even more interaction and a place to share about your writing process, details behind the scenes, and so much more. If you are an author and you do not have a website, you are missing out on a fantastic marketing tool. If you are an author and you are just relying on your social media accounts to market your book, you are only tapping into a small percentage of your possible potential online marketing. Don’t overlook this important and useful part of your book and brand marketing. Do you need help with your online marketing efforts? Let’s talk. We’d love to help you prepare some real actionable steps you can take with your book promotion. Sign up for our free newsletter for updates on our latest news, resources, tips and offerings! Archer Creative is the duo of Randy and Karla Archer. We are multimedia marketers & storytellers - designers, videographers & brand strategists - who specialize in creating work that doesn't just look good, but moves you closer to meeting your goals and connecting with your audience. Put our knowledge and experience to work for you. No matter what medium you are using, we'll make sure that it's not only pixel perfect, but functions well, meets your goals, and connects you with your readers, customers and clients.